In homes built prior to about 1985, builders often did not install wiring for an overhead light in common spaces. I suppose it was fashionable at the time to have lamps warmly lighting a living room- but in today’s multi-purpose living room, it’s far preferable to have an option to flip a switch to fully illuminate the room on demand. My living room was one such construction. I wanted one switch near the door to control the lights in my living room, and I wasn’t about to open the pandora’s box of having an electrician run wires through Hawk Hill’s 90 year old plaster and lathe walls. It took a bit of research and creativity, but I figured out how to have my cake and eat it too- now when the wall switch is flipped in Hawk Hill’s living room, a chandelier and lamp brightly illuminate the room. Thrilled with the results for a few months now, I thought I’d take a few minutes to share the instructions for illuminating your own lair of darkness. I picked a chandelier (of course!) but any fixture designed to hang should work (i.e. a modified pendant or drum shade style fixture should work). I already have a popular blog post on how to convert a light fixture to a plug-in style lamp, but for optimal safety you’ll want to convert this light fixture a little differently from that method. You’ll need to install a hook on your ceiling for your new light. 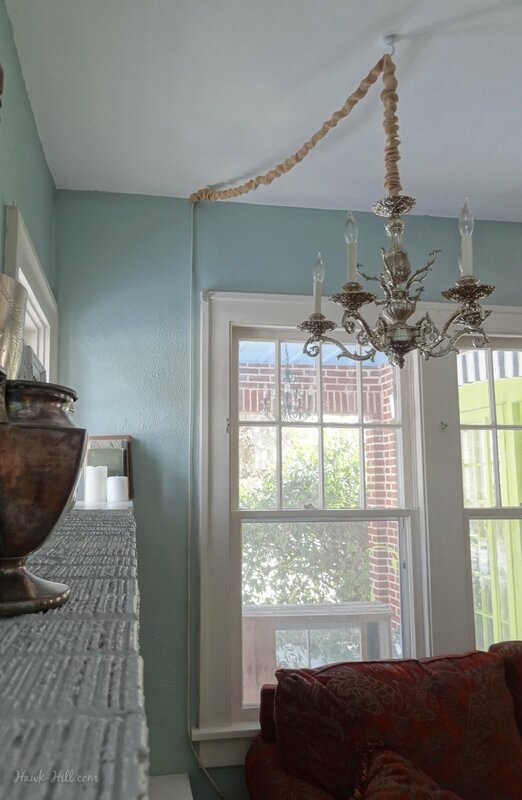 Because light fixtures can be heavy and especially dangerous if they fall, it’s very very important that you use a good quality hook and anchor it a ceiling joist or beam. Locate a joist just like you would locate a wall stud. Any stud finder or a number of tricks you can find via google should help you locate a joist to install a hook for your light. Once you have your light rewired and ceiling hook installed, installation can be as simple as just hanging the light fixture, however I’d advise putting some thought into how to mask or cover your cord. 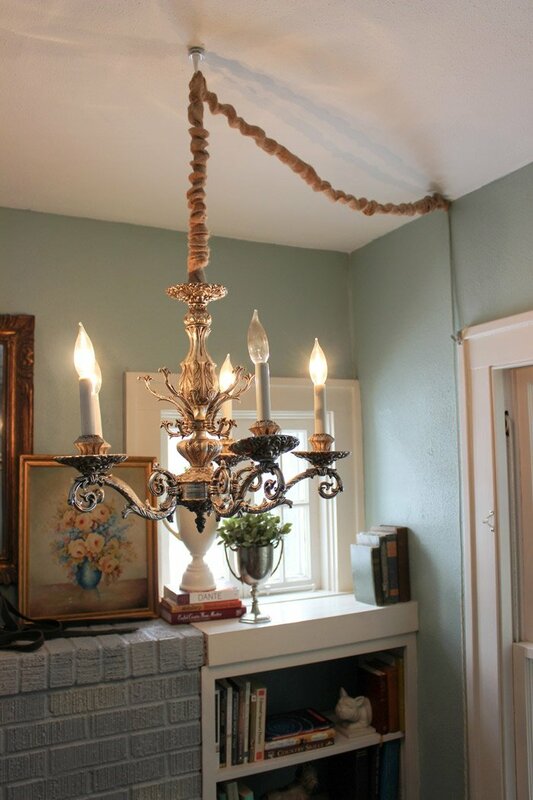 With your light hanging from the ceiling, the cord will be very visible. I chose a Velcro-On Chandelier Cord Cover to make my extension cord a bit less of an eyesore. (another option: use a custom length cord disguised as a manila rope available from Haddock Industrial. A burlap cord covers adds style to the exposed cord. Also give thought to the fact that your cord will be running down your wall. 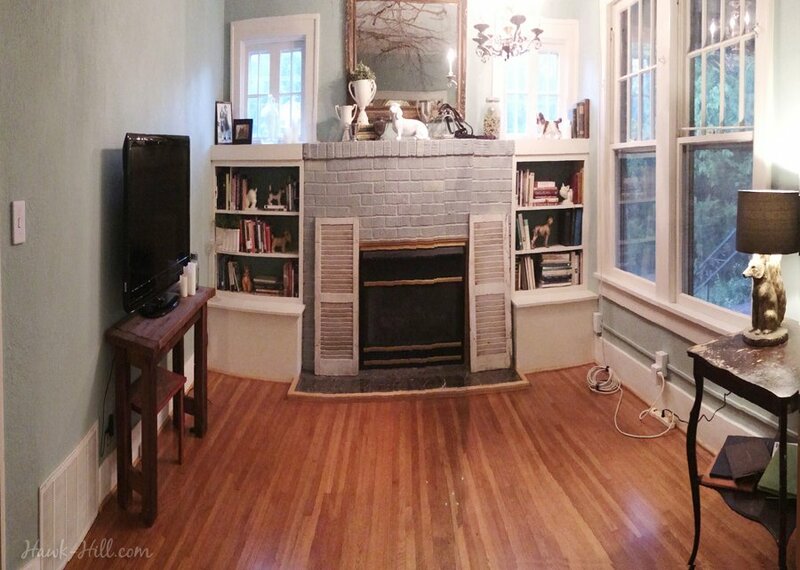 Can you conceal it behind molding? Tuck it around a picture frame? 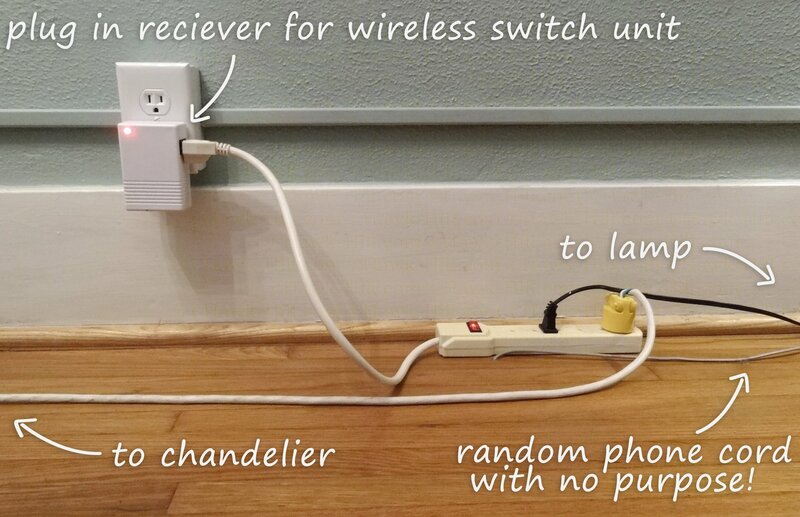 You may wish to paint your extension cord to help it blend in to your wall. To easily paint a cord, just place a plastic sandwich bag over your hand, place an old sock over the plastic baggie, and then place a few tablespoons of paint in your palm. You can paint an extension cord in moments by pulling the cord through your paint filled mitt. 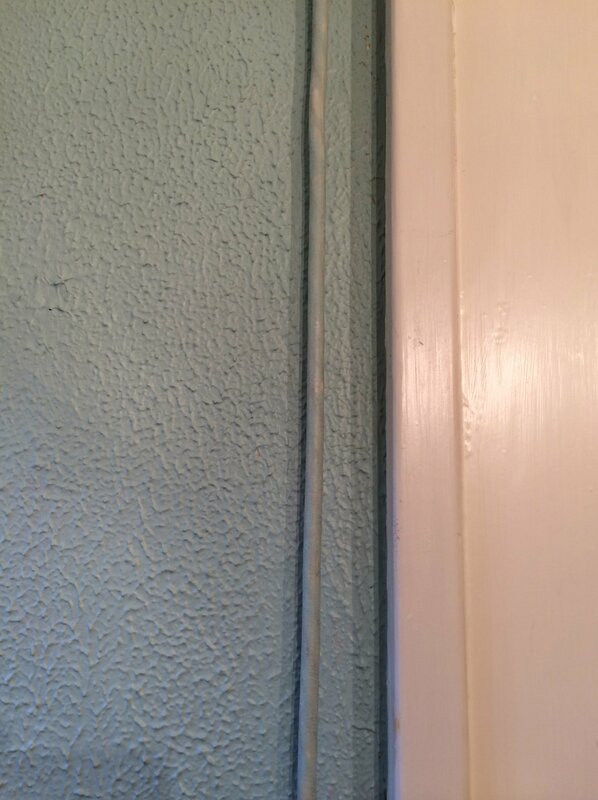 The exposed section of my cord is painted Wythe Blue to match the walls. My light’s cord runs down the wall. To conceal it, I arranged the cord so it runs down the wall on the far side of window moulding. 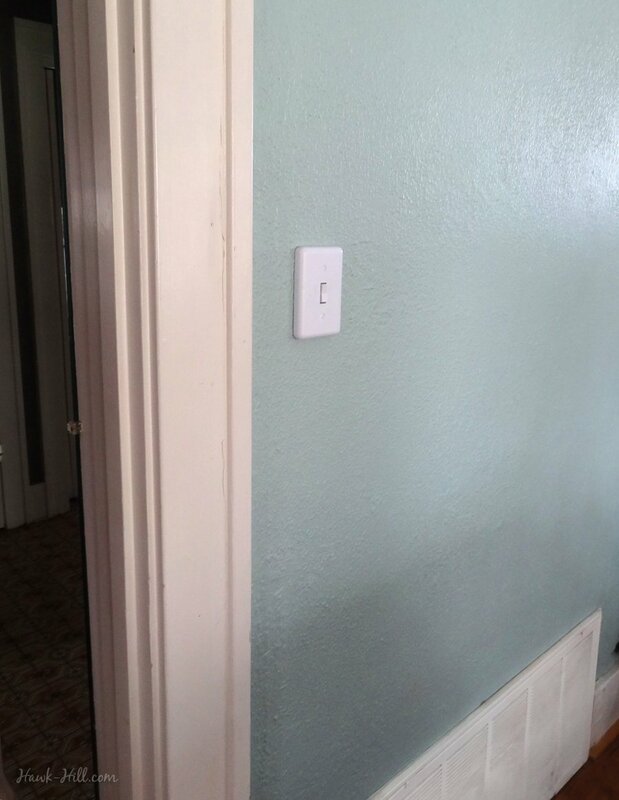 The cord was then painted the same color as the wall. This product comes in two parts: a wireless switch (basically, a remote control) that you attach to your wall, and a remotely controlled outlet that you plug your light into which turns the light on or off according to the signal sent by the wireless switch. This wall light switch is actually a wireless remote styled as a light switch. How I light my living room that has no wiring for an overhead light: the wireless remote (looks like a light switch) is screwed to the wall on the left side of the photo, and the wireless receiver outlet (centered below double windows) turns on or off power to the lamp and a specially modified chandelier (click here for instructions) when the wireless switch is flipped. 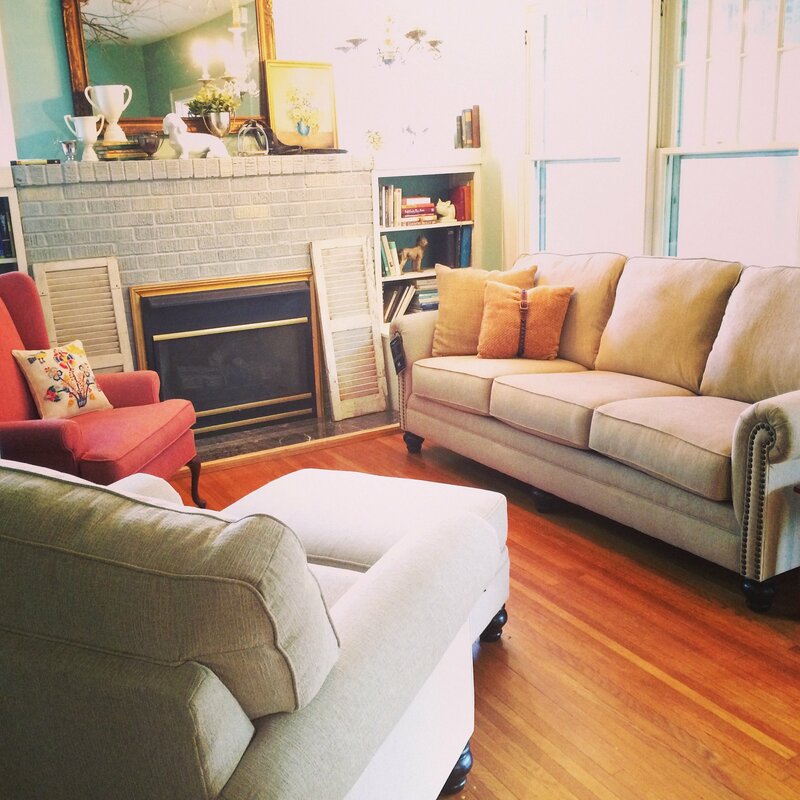 I still consider my living room a work in progress, but love how it’s coming together. Here are a few work-in-progress shots. Finally loving my mantel. 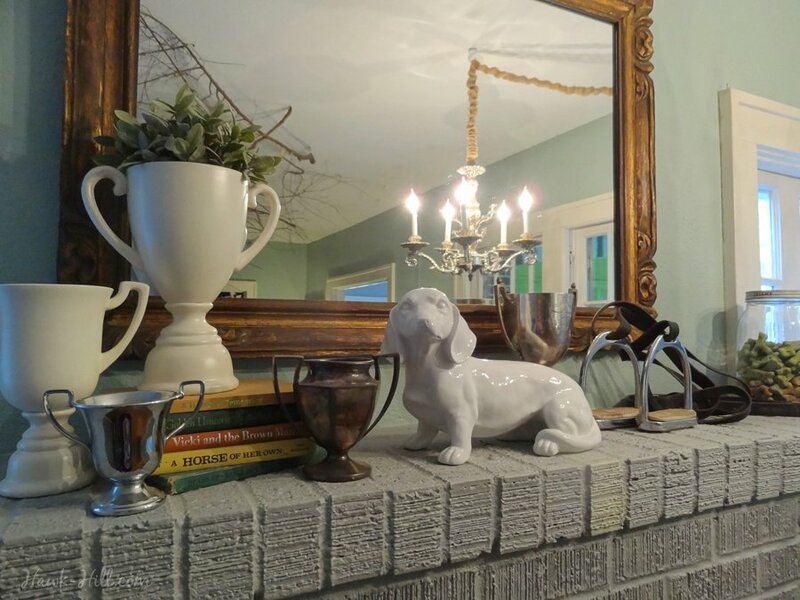 Trophy cups, stirrups, and horse books make it equestrian themed, but when this white dachshund figure came home, I knew just where he belonged! 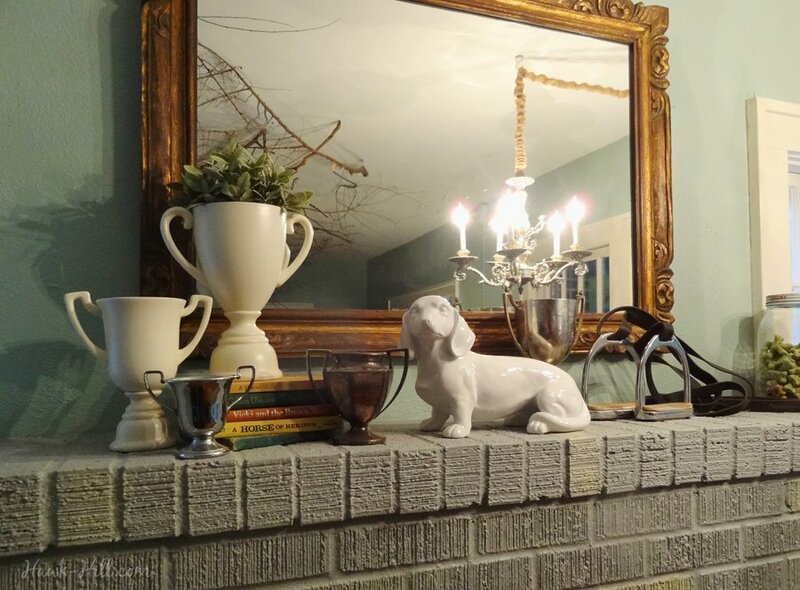 I love decorating with animals and re-purposed animal handling equipment. 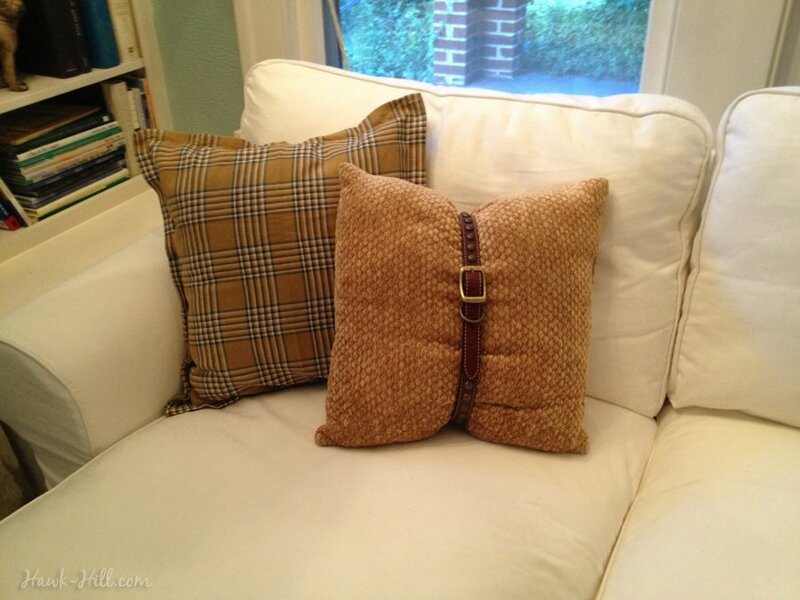 In this shot, an heirloom quality dog collar adds style to a cheap throw pillow. 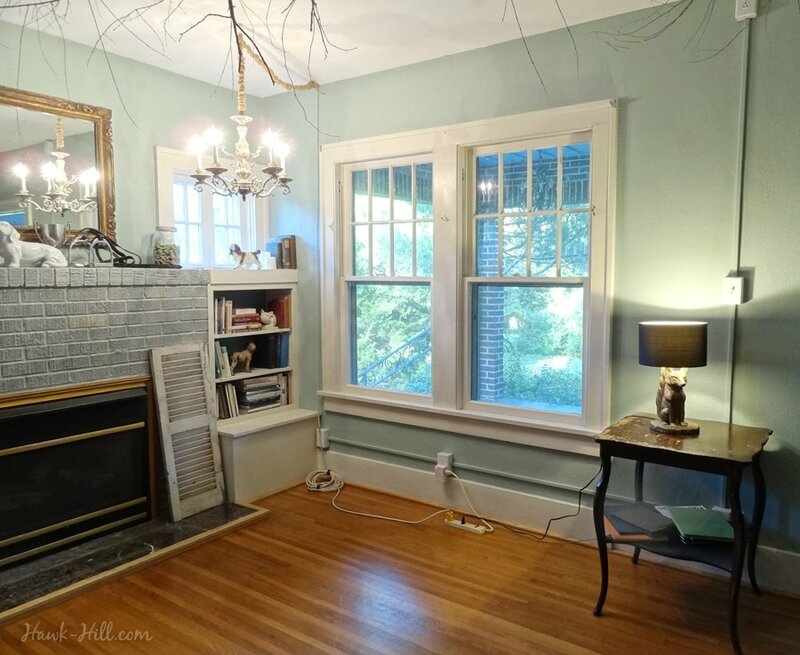 In 2015 I made the big plunge into tiny living, and two chandeliers made it past the “love-inventory” and were packed along into my downsized life. 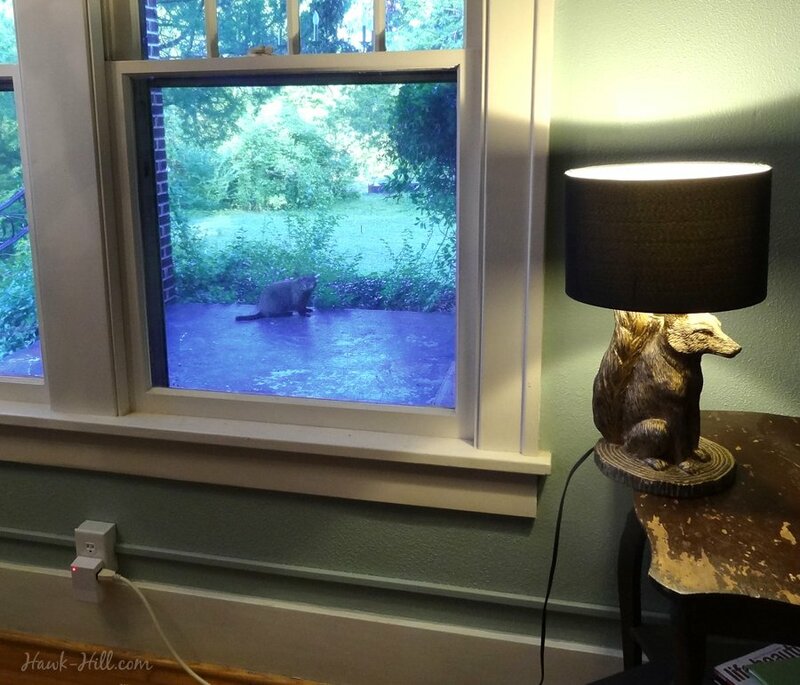 Although my studio apartment in downtown Seattle had overhead lighting, it never seemed bright enough to push back the gloom of Seattle winter enough to work on the art, craft, and DIY projects that demand good lighting. So I hung a chandelier in my apartment and repeated this method once again, this time with one change: instead of mounting the wireless remote as a light switch, I hung it with velcro-style command strips. This allows me to carry the remote to bed with me on nights I want the room fully lit as I get ready for bed, and turn the light off- without getting up- when I’m ready for bed. This has been such a small luxury- and such a delight to settle into bed with a book by the warm light of a chandelier. If this tutorial helped you solve your room-lighting challenges and spared an electrician bill, would you consider saying thanks by buying me a coffee or helping keep Hawk-Hill online with a $1 per month patronage of the creative cavorting behind Hawk Hill? I have a great chandelier I would love to convert since I live in a rental and my living room is a cave, lol. I have high ceilings, no attic space above but I do have beams. Not sure if they are primarily decorative and will truly support the weight. Any suggestions on how to confirm this? Would hate to find out the hard way…!! Alternately, you could hang a plant hook high on the wall (you know the type- they’re shaped like a shelf bracket), screwed to a stud. That might work! Could you give me the name brand of the switch you’re using and do you still like it? I need to use something like this for a light in my apartment hallway, which is very dark. I considered those push-on lights, but they aren’t very sturdy and won’t last long enough, so I’m going to mount a pendant light in the hallway. Never mind. I see the name brand now, but it doesn’t have good reviews, so I think I’ll keep looking. How did your project turn out? The switch I use is the Westek 100LC. I’ve got three in use around the property, the oldest going on 6 years, and I’ve had 0 problems with them! Thank you so much for this post Lindsayanne. You have been so helpful. I live in a prewar plaster/high ceiling apartment. There is no ceiling light installed in the living room and the living room is 22 feet long. 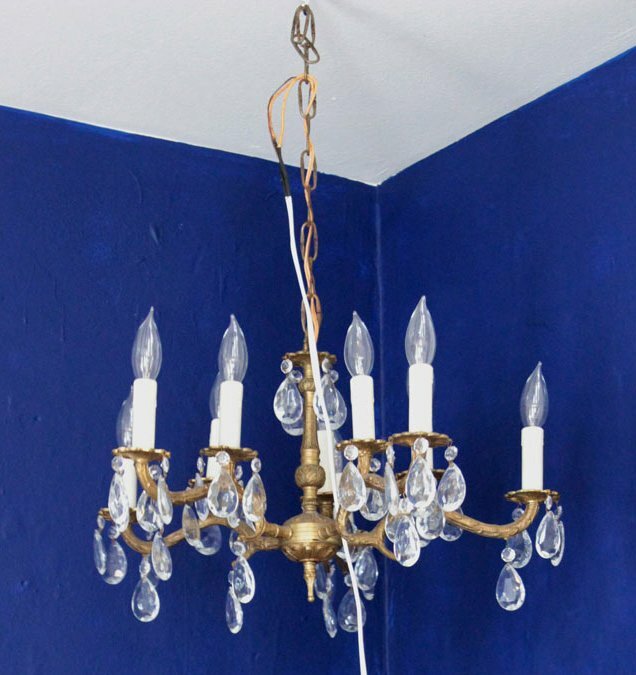 My biggest fear is only the part of getting a hook onto the ceiling to hang the chandelier from. I am so paranoid that it might fall. Any suggestions? Is there a special type of hook I can purchase that will hold on for dear life? How is the cord attached to the hook to maintain the length and the slack? Great question! I think I have an image that might answer your question better than an explanation, so I’m including it below. 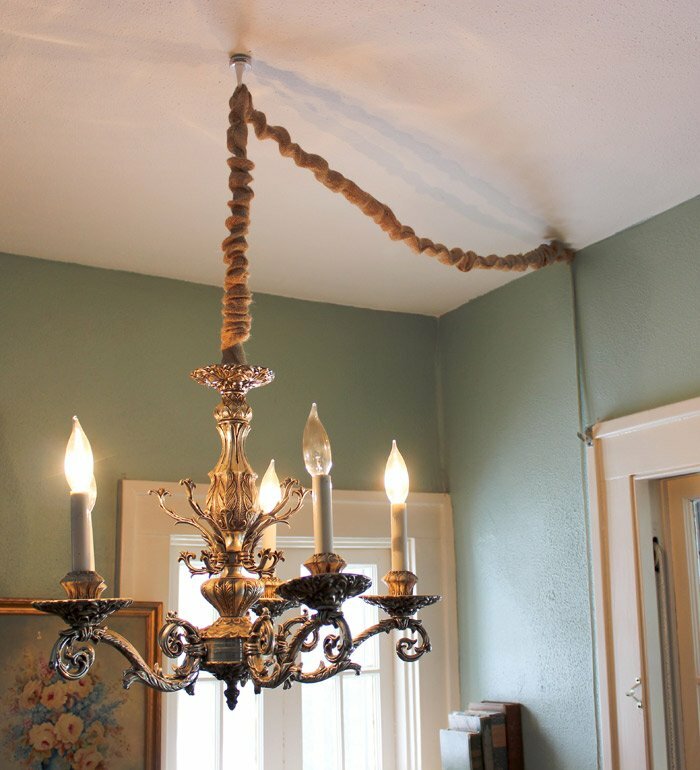 Unlike many lightweight modern fixtures, generally, older/larger chandeliers have a chain for mounting- and the electrical cord is threaded through it so that the actual wires bear no weight.